Renovations to this tank are fairly major and will be covered by a lot of photos over a number of threads so you can easily open them. 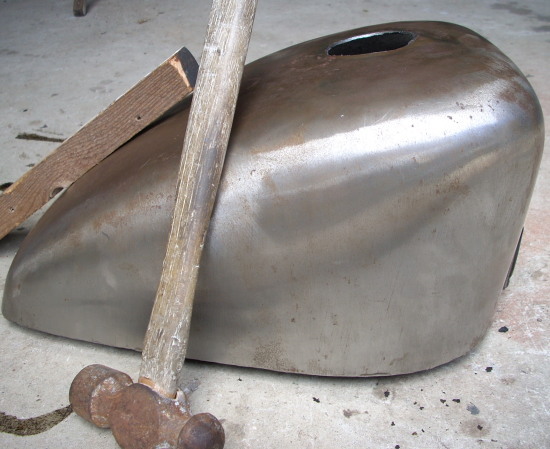 The saga began with Tex, a Queenslander asking if it was possible to set up a frisco-mounted King Sportster tank on his Shovel without removing the original mounts... and without me having the bike! 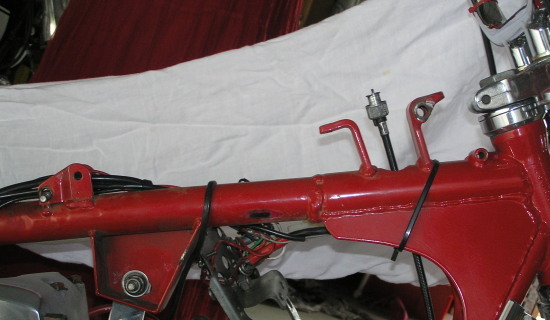 One of the problems with Frisco mounting is the loss of access to the fuel because both the tap and the filler are mounted near the middle of the tank. Area below bottom red line and above top red line show lost fuel... a significant amount on a big inch motor. 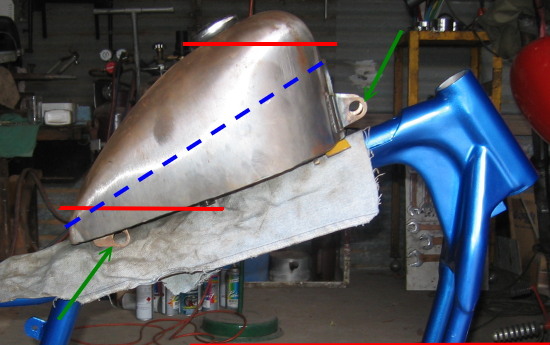 The major benefit of Frisco mounting is the gain in fuel when the high tunnel is removed (see dotted blue line. 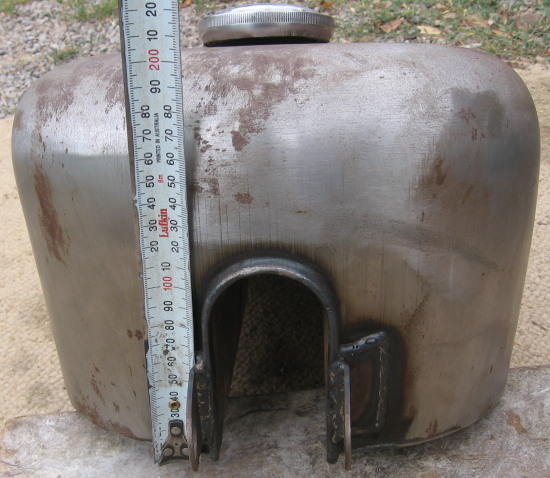 In this case, gaining as much extra capacity as possible is particularly important because the boxing that will have to be done to allow the tank to fit over the existing brackets will reduce fuel capacity. Cutting out the tunnel is relatively easy with an angle grinder using 1mm blades. This was a new tank so there had never been any petrol in it. 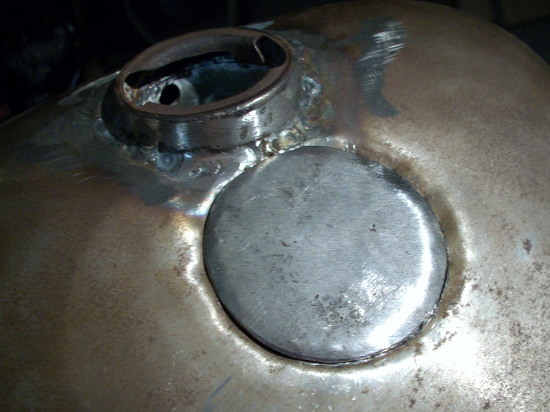 Before getting a flame (welding) or sparks (cutting & welding) near a tank it is essential that you get rid of all fumes. People I know of have been killed or seriously injured by not being fastidious about this. Best way I've found, is to wash out the tank with detergent and hot water and then blow out thoroughly with compressed air... then do the smell test... If there is NO petrol smell then hide behind a wall and play a flame over an opening in the tank... to be doubly safe... it's tough trying to ride a chopper with no hands and being half blind! If you don't have compressed air throw in some gravel with the hot detergent water and shake thoroughly until there is absolutely no smell. 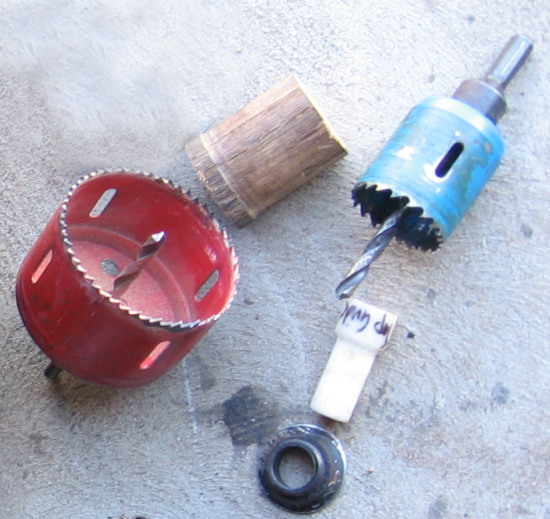 The holes are cut out with bi-metal saws in a drill. To keep them centred I've made up a couple of collars that fit with 2mm clearance inside the tap mounting and teh filler mounting. Small one is from some nylon bushing material and the larger one is from wood. 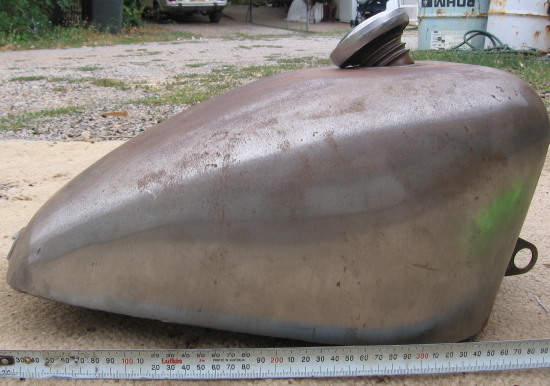 If you look at the first photo in this series, you'll note that King Sportster tanks have an ugly flat area around the filler cap. 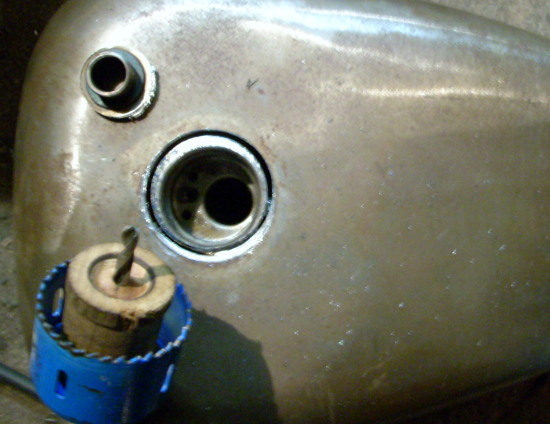 In this pic you'll see that the top of the tank has been hammered out with a hammer and long block of wood. 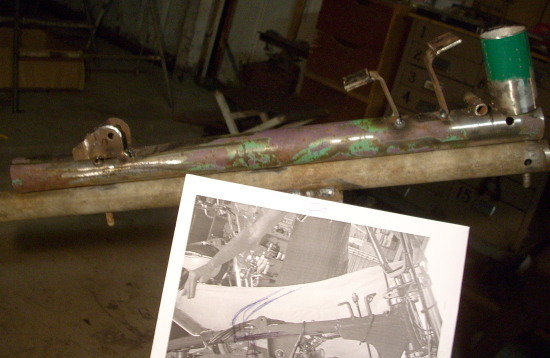 The end of the wood has been slightly angled to allow it to be put through the tunnel at an angle to shape the tank top with out creating sharp dents. The edges have also been rounded off. This not only looks a hundred percent, but also increases capacity slightly... everything counts with a small tank on a big bike. 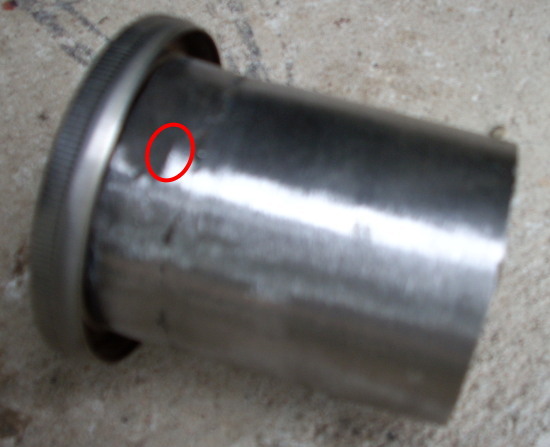 Here the hole for the new filler has been cut, with a bi-metal saw. The nifty tool in the picture is a piece of square bar with some hacksaw cuts and some bends so allow the edge of the hole to be folded. 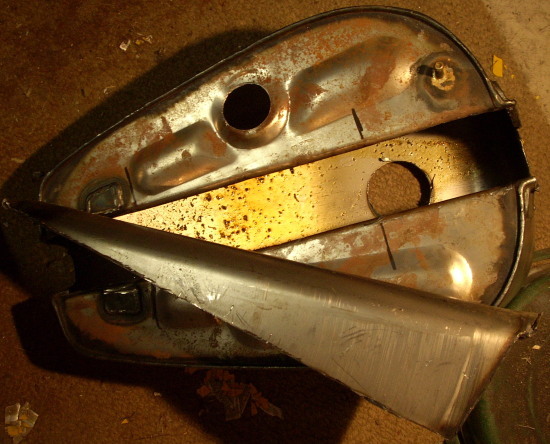 Folding in the edges is so the welding on the filler plate does not protrude. 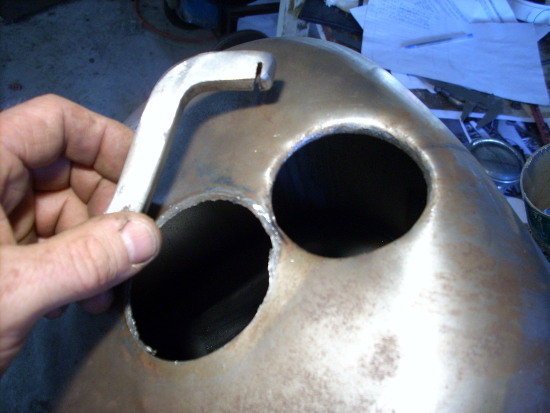 Next is the filler spout... Tex wants an older style filler, so the original is put in a box and an old one is found from a wrecked early model tank. To reduce splashing, it is worth adding an 3" extension to the filler that will protrude down into the tank. 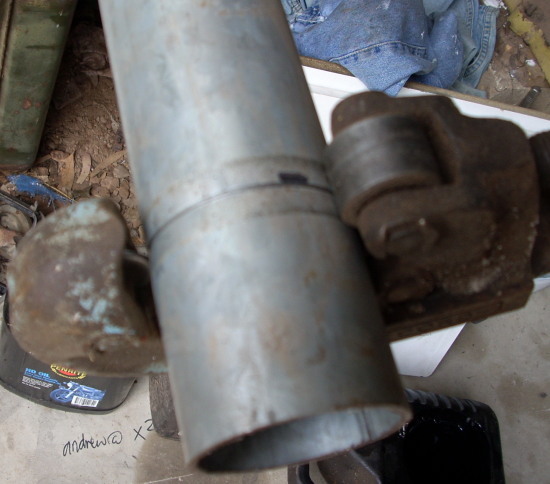 This is cut from some scrap tube that is the same diameter. 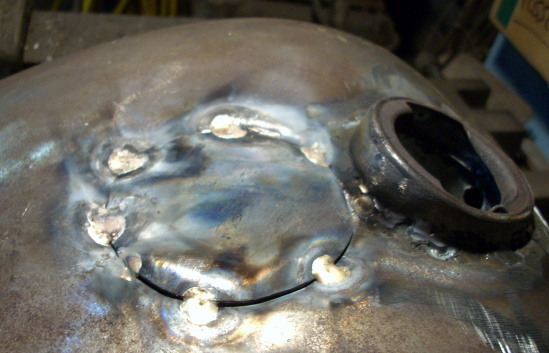 This piece was galvanised, so the galvanising had to be rmeoved on linishing belt to allow clean welding. Patch is being bronze welded. 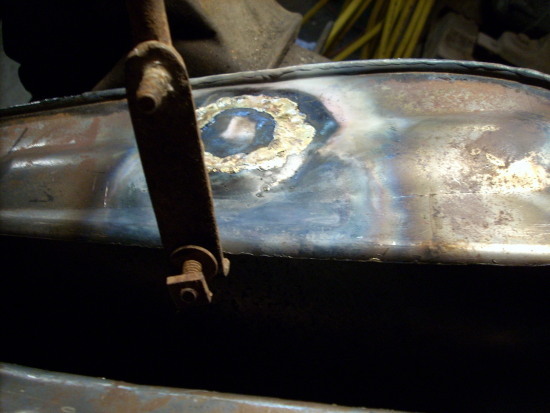 To minimise distortion, tack weld as in this pic and do small sections on opposite sides as you weld it in. Using a wet rag also draws some of the heat out. 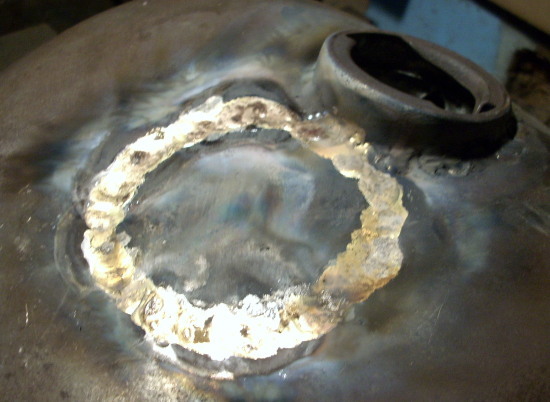 Welding finished with only one small raised bit due to heat distortion... removed by reheating and tapping back in with a small hammer.